The City Commission is the legislative and governing body for the city. The Commission’s role is to adopt laws and policies to govern the city, leaving implementation up to the City Manager and the rest of the city staff. As specified by the charter for the city of Benton Harbor, the Board of Commissioners must be qualified electors of the City of Benton Harbor and are elected on a non-partisan ticket. The Commission consists of one Mayor who is elected by the electors of the City at large for a term of two years, and eight Commissioners. Four Commissioners are elected by the electors of the City at large for terms of two years, with two of those Commissioners elected each year. Each of the four remaining Commissioners are elected from and by wards for two year terms. 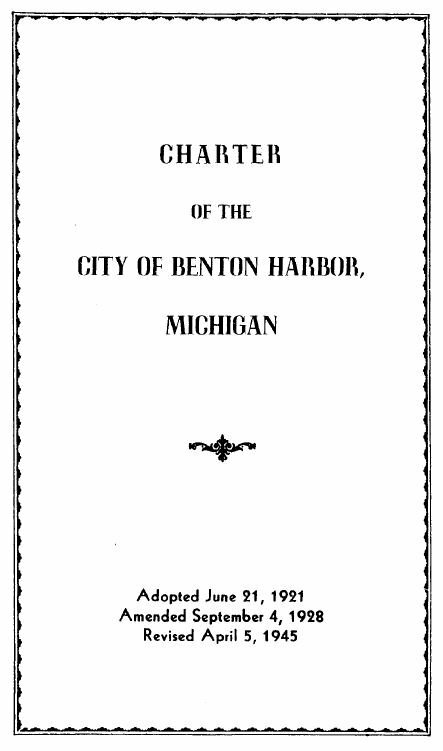 For the official Benton Harbor Plan of Government, consult the City Charter. Please fill out the appropriate application. Save gas and stamps by using our convenient online services to pay your taxes or utility bills (water and trash services). If you have questions about your trash services, or to arrange for the pickup of large items, call We-Cycle Industrial Sanitation direct at (269) 926-6360. Every 1st and 3rd Monday at 7pm. Every Third Wednesday of each month at 5:30pm. Every Second Wednesday of each month at 5:30pm. Every First Wednesday of each month at 5:30pm. Every Fourth Wednesday of each month at 5:30. Every Fourth Monday of each month at 5:30pm.